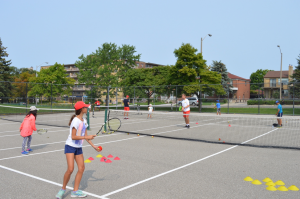 Summer 2016 consisted of thirty-eight enthusiastic tennis instructors and three highly qualified supervisors, servicing eighteen sites and welcoming over 8,500 campers into the program. We also included 37 volunteer tennis instructors ranging in age from 15 to 52 who clocked over 2040 hours of volunteerism. This year the Toronto Sports Leadership program was available to the 15 and 16 year old who live in priority needs neighbourhoods and volunteered at our sites. The youth helped out with the younger children and spent time each day working with our instructors to reach a 3.0 level of tennis ability. The successful participants will work with the City of Toronto throughout the winter and attend seminars on childcare, first aid, resume writing and interview techniques. 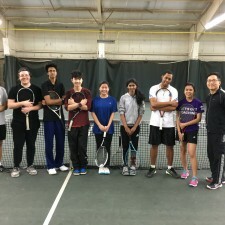 In January and February, thanks to free tennis court time given to us by the Scarborough Winter Tennis Club, we will be able to offer lessons to these volunteers helping them become Tennis Canada Level 1 certification ready. Once ready, if they qualify, they receive financial assistance from Tennis Canada and Philpott to ensure they can attend the certification course. In 2016 100% of our candidates passed the Tennis Canada certification course held during the March break. Once a youth receives their Level One certification, we offer them paid employment as Philpott tennis instructors. This summer six of our Philpott instructors came through this program. 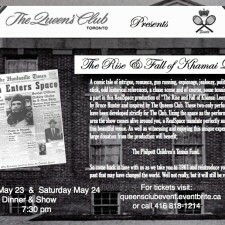 They taught tennis in the neighbourhoods where they grew up, having learned their first tennis as Philpott campers. They are exceptional leaders and mentors to the younger children. We are thankful for the support of the Toronto tennis community, individual donors and Toronto’s largest private tennis clubs, namely The Boulevard Club, The Cricket Club, The Granite Club, The Toronto Badminton and Racquet Club and The Toronto Lawn Tennis Club. This year our major financial partners include Tennis Canada, Canadian Tire Jumpstart Charities, the Philpott Ladies Invitational (hosted by The Toronto Badminton and Racquet Club in 2016 and The Boulevard Club in 2017), the Tennis-A-Thon tournaments, the Leaside Tennis Club, the Davisville Tennis Club, the Toronto Lawn Tennis Club, the CIBC Children’s Miracle, the Charles Johnson Foundation, the Gooder Foundation, the Marion Armstrong Foundation and the Daniel Nestor Foundation. We are always extremely grateful to Head Canada and Wilson Sport and The Merchant of Tennis. Once again the Racquet Donation Program was a tremendous success and with the support of Toronto tennis players and the McCain Jensen family, we gave away over 500 racquets and a new can of tennis balls for each gifted racquet. None of these amazing successes would happen without the hard work and dedication of a large number of people. Philpott is a grass roots charity supported by tennis players who want to give back to a sport that has made such a difference in their lives. The Philpott Board and most especially the Philpott children say a huge thank you!